My sweet grandma. She requested portraits of her great grandchildren months ago, so when I read this my heart sank!! I have been so, so busy… with life just in general, but I am sad that I let this get in the way. I usually do more storytelling type imagery. It’s just easier with a house full of children to watch them play and capture what unfolds. I definitely believe there is a place for good old fashioned portraits though and I have been secretly dying to get into portraiture more, but it’s one of those areas I know would be tough because my kids do not want to sit still as you can see from this first image. 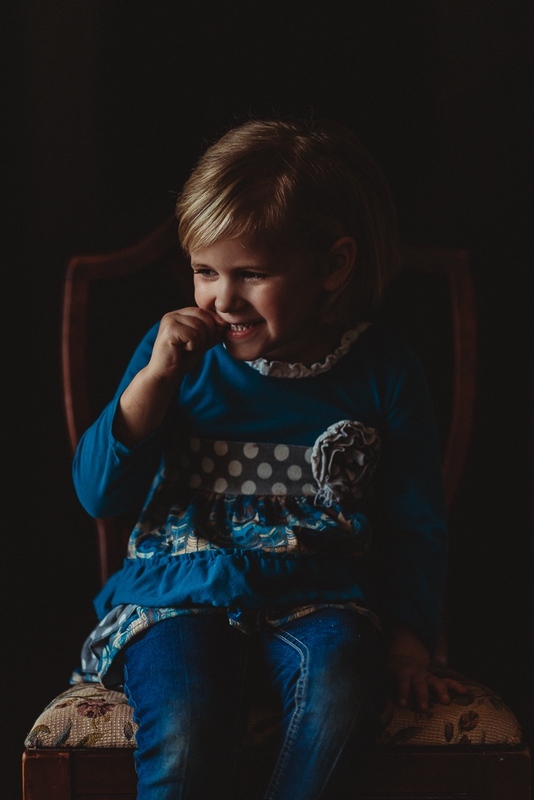 So, here is my super quick 3 tips for capturing portraits of your children in a hurry. I decided just to make it as easy as possible and to utilize just one prop, a simple chair, but it really can be anything you want. A window or a door way, no matter the size will work. Make sure you place your subject in the light, in the way you prefer as an artist. I placed my children all at 90 degree angles to the window in order to utilize a more dramatic side light. You could position them and any way with this window…. such as facing it completely in order to get flat light, if that is what you are looking for. When I utilize dramatic side lighting I always expose for my subjects brightest area on their skin. I have my metering mode on spot meter and I get the light meter to just where I want it on the brightest part of their skin. This will get that little sliver of light correctly exposed and the rest will fall away into darkness. A lot of the time I have my ISO on 200 or even 100 for this type of shot. My settings here were 35mm f/2.0 ISO 100 and 1/100th of a sec. I have only gotten two portraits finished so far, but I have also got nine children. So you can see why I needed a way to get this done as quick as possible. I hope you found these quick tips helpful. I would love to hear any tips you have for capturing portraits of your kids. Comment below!